Recently, when I was making the minisite for markapp.io, I realized a neat trick one can do with CSS variables, precisely due to their dynamic nature. Let’s say you want to use a property that has multiple versions: an unprefixed one and one or more prefixed ones. In this example we are going to use clip-path, which currently needs both an unprefixed version and a -webkit- prefixed one, however the technique works for any property and any number of prefixes or different property names, as long as the value is the same across all variations of the property name. 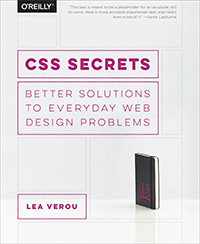 Even !important should work, because it affects the cascading of CSS variables. Furthermore, if for some reason you want to explicitly set -webkit-clip-path, you can do that too, again because * has zero specificity. The main downside to this is that it limits browser support to the intersection of the support for the feature you are using and support for CSS Variables. However, all browsers except Edge support CSS variables, and Edge is working on it. I can’t see any other downsides to it (except having to use a different property name obvs), but if you do, let me know in the comments! This entry was posted in Original, Tips and tagged CSS, CSS variables. Bookmark the permalink.